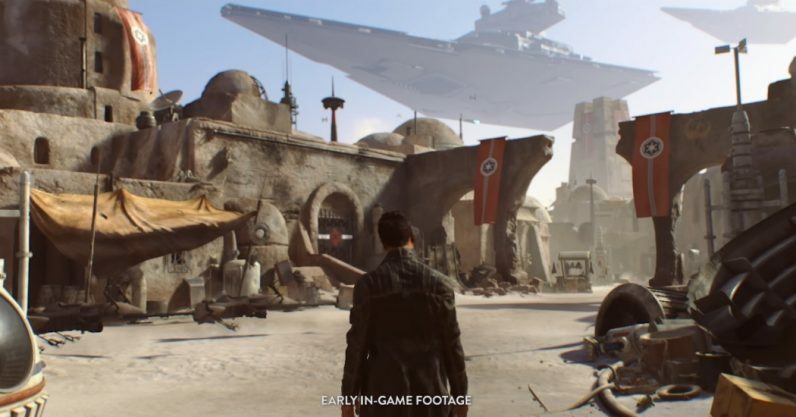 Reports circulated last night reveal that one of Electronic Arts‘s upcoming Star Wars games, revealed almost three years ago, has now been quietly canceled by the publisher. Apparently a “broader experience” would have taken far too long to build, though. According to Kotaku, EA is breaking up the Star Wars project into two smaller games, the first of which is planned for release next year. If this were any other license, this would probably not be as big a deal as it seems. Games go into development, only to be cancelled or changed all the time. Heck, the mere mention of the defunct Scalebound makes me start howling “Too soon!” But because this is part of Star Wars, a property that occupies that Venn diagram space between “nostalgic love” and “current cultural lynchpin,” it just seems to matter more. Heck, you’ve still got gamers hoping for reports about Star Wars 1313, a video game abandoned by Disney almost six years ago — to the point that several people are coming together to produce a fan remake. Of course, this isn’t helped by the fact that EA seems to have had so many Star Wars games in development that just haven’t materialized. While it has produced two Battlefront games (and Star Wars: The Old Republic, which is, shockingly, still around), the bulk of its story-driven or new titles are always scheduled for some point in the future. We’re still waiting for more news on the game being made by Motive Studios, assuming it still exists following the departure of founder Jade Raymond. Another studio, Respawn, is supposedly releasing Jedi: Fallen Order this year, but we’ve not thus far seen a trailer or much of anything on that game. And that’s the main reason this stings so much. Battlefront‘s multiplayer is one thing, but what gamers haven’t had in years is a good single-player Star Wars game, like the Jedi Knight games or Knights of the Old Republic. EA Vancouver’s project looked poised to fill that niche, so the fact that it’s joined the ranks of cancelled Star Wars projects is disheartening. We’ve contacted EA for more information about the future of the Star Wars games.